Rendering of a UMKC-bound streetcar leaving downtown on Main Street. Washington transit officials have rated the Kansas City Streetcar Authority’s $151.6 million federal funding application “medium high,” a vital step toward building the planned extension from downtown to UMKC. While the Federal Transit Administration rating doesn’t guarantee funding in the pending federal budget, anything below a medium rating would have killed the project’s pursuit of a construction grant through the New Starts program. The Trump Administration has recommended a FY 2020 transit capital budget that includes an additional $500 million for new projects like Kansas City’s. Congress also could decide to expand that amount in its own budget review process, Gerend noted. “The good news is the administration’s budget includes money for New Starts that includes funds for past agreements and money for new projects,” he said. 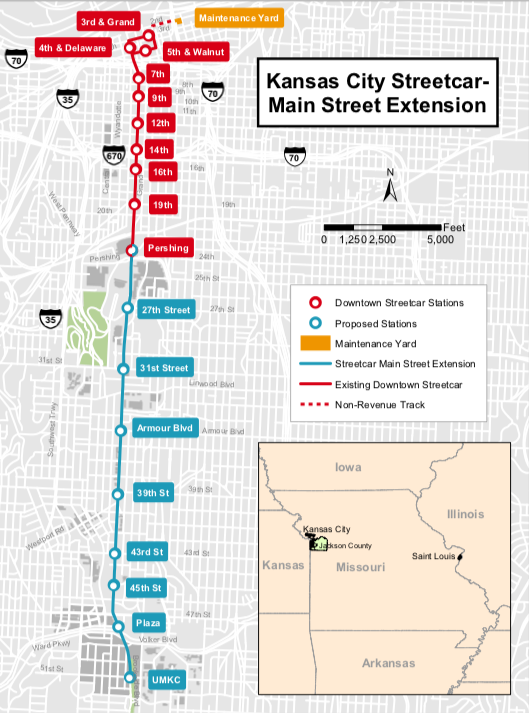 The planned 3.5-mile extension of the streetcar line along Main Street from downtown to UMKC is considered a vital step toward realizing the full potential of the system. The earliest the extension to UMKC could begin operation is 2023. The 2.2-mile downtown line, which runs along Main between Union Station and the River Market, opened in May 2016. Last year, 2.1 million riders used the streetcar, up 2.6 percent from the previous year. As part of their evaluation of the streetcar extension, federal officials noted the success of the downtown streetcar line as an economic development tool. “Since the downtown streetcar line opened in 2016, many developments have been completed or proposed that overall appear to be supportive of transit,” the FTA report noted. “Nearly 48 acres of vacant land in addition to a number of surface parking lots could be redeveloped with transit-supportive densities and character. The Federal Transit Authority rating indicates there are ample opportunities for development along the proposed extension route. The proposed streetcar extension already has prompted strong development interest including a $34 million renovation of the historic Netherlands Hotel and Monarch Storage buildings at 39th and Main into apartments. The FTA review gave the land-use rating for the project a “medium-low,” noting the average population density along the extension was 5,100 per square mile. The project would serve 104,000 employees, according to the agency. Among the destinations that would be served in addition to UMKC are the Federal Reserve Bank, Metropolitan Community College, St. Luke’s Hospital, the Country Club Plaza, social service organizations, museums, and an “emerging theater district,” the FTA report noted. The $316.6 million capital budget for the extension has 47.9 percent of its funding coming from Washington with the remaining 52.1 percent or $165 million coming from a local transportation development district that was approved by voters in the corridor last June. The FTA estimated the annual operating costs for the streetcar extension would be $7 million. Riders would continue to use the expanded streetcar without paying a fare, according to the FTA application review. As part of the project, the Streetcar Authority plans to acquire six more cars. The nine-stations planned for the route along Main would be served every 10 minutes during weekday peak hours, and every 12 minutes during weekday evenings and weekends. Gerend said the authority will continue to do technical work along the planned route while it waits to hear from Washington whether construction funds for the project will be included in the new budget. In a statement, the Greater Kansas City Chamber of Commerce described the FTA rating as boding well for the project. “The Chamber has been a strong supporter of the streetcar, and will continue its advocacy efforts in Washington D.C. on behalf of the project,” Joe Reardon, president, and CEO, said. On a separate track, the Streetcar Authority also is continuing to pursue a one-mile, $32 million extension of the route from the River Market to the Berkley Riverfront Park. That project is supported by Port KC and the Kansas City Area Transportation Authority. The Kansas City streetcar rolled out of 2018 with ridership up 2.6 percent over the previous year and looking for signals early in the new year about its planned expansions to the riverfront and UMKC. The downtown streetcar attracted 2,114,886 rides last year compared to 2,060,327 in 2017. Overall, more than 5.5 million people have ridden the line since it opened in May 2016. A multimodal plan to extend the streetcar line to the riverfront, including a new concept to build a separate bicycle and pedestrian bridge next to the Grand Boulevard viaduct, continues to roll, but without help from Washington. Kansas City streetcar advocates got a big win Wednesday, when election officials announced that the tax increase to help fund extending the line to the University of Missouri-Kansas City passed. That means work on the $227 million project can begin in earnest. The team behind a potential southern streetcar expansion has refined the proposed stops. Voters who live near the streetcar have yet to decide whether to approve a 1 percent sales tax and special property tax assessment to help fund the $230 million dollar project. Notarized ballots are due to the Jackson County courthouse by 5 p.m. June 12.